You have seen it, you know it, you love it? The Nissan Juke-R. A Juke, with not much of the original Juke left, but lots of Nissan GT-R added where the Juke is gone. Someone mentioned that we now know where the Delta Wing got its 1.6 liter DIG-T engine. So how did the Juke-R and GT-R compare on a lap of the south circuit at Bedford Autodrome? The supercar went first, when the track was still slightly damp, but the low-down thrust of its engine came to the fore as it recorded a time of 65.8 seconds. 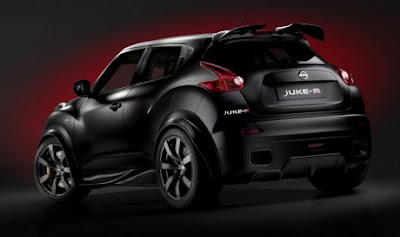 By the time the Juke-R went against the stopwatch, the track had dried out a bit. The less aerodynamic shape held the car back over the circuit's long straights, and it took 1.3 seconds longer, with a time of 67.1 seconds -- a sterling effort considering its less powerful engine and additional weight.